A 9-year-old girl identified as Irebami who was relocated to Togo, Republic of Benin, a year ago by the ex-lover of her mother - has been reunited with her family. 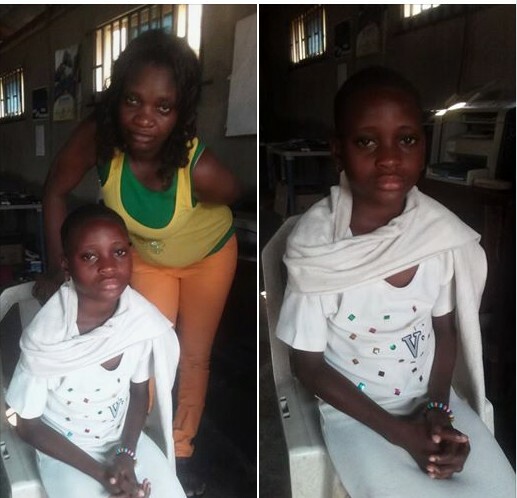 The young girl was reunited with her mother at a police station in Lagos on Monday (yesterday). Men of Ikotun Police Division,Lagos, last week interrogated a Lagos –based herbalist, Kofi Mesan, for allegedly abducting the daughter of his lover, Adebisi Adelowo. Adelowo, a mother of four had accused her former boyfriend, Mesan, of abducting her daughter, Irebami, and relocating her to Togo. Adebisi, also disclosed that Mesan was not Irebami’s biological father. According to the woman, Mesan, who lives in Isheri-Olofin area of Alimosho Local Government, allegedly tricked her into releasing her daughter to him with a promise to help her enrol the girl in school. She claimed that her daughter’s father was one Toyin Awolere, a spare parts dealer at Ladipo Market, Mushin, Lagos. She said that Awolere proposed to her in 2007, and their relationship resulted in pregnancy. Adebisi said Awolere abandoned her shortly after her mother died of a strange illness. She said she was introduced to Mesan in the course of searching for a solution to her mother’s mysterious illness. She added that Mesan took advantage of her crashed marriage to lure her into a relationship, after his marriage to another woman crashed. Mesan, however, allegedly relocated her daughter to Togo, without her consent.